﻿ First ride: Just what is Honda’s curious new CB1000R all about? What it isn’t, is the naked Blade that many were hoping for. Indeed from a power, handling and poise point of view, it doesn’t have the speed-crazed performance of stripped down superbikes, like Aprilia’s Tuono, the BMW S1000R or Yamaha MT-10. It will, however kick the butts of the latest crop of café racer-styled machines, like the BMW R nineT, Triumph Thruxton, Kawasaki Z900RS and the new Ducati Scrambler 1100. The Honda is also smoother, more refined and technologically advanced than its home-grown compatriots: Suzuki’s GSX-S1000 and Kawasaki Z1000, too. Think of the CB1000R as a Speed Triple rival, sitting between a super and sports naked and you won’t be a million miles off. Just like the Triumph, the new Honda delivers just the right mix of style, fun, power and handling for the road. The very best thing about the new CB is the way it’s been put together. This is Honda build quality and attention to detail at its magnificent best. The devil is in the detail and you get the feeling every component was thought through and lovingly chosen by the Japanese engineers: the fresh-from-the-gun deep black gloss paint finish, the brushed ali panelling, red saddle stitching and embossed radiator guard and seat back logos. The elegant new subframe design features pillion grab handle cut-outs and the funky clocks are a 70s Tomorrow’s World glimpse into the future. That slash-cut exhaust looks and sounds so good there’s no need to go aftermarket. LED headlights feature old school cooling fins, even though they’re not needed and together with the rear light they’re so thin the snub-nosed bodywork is smaller and more compact. The red sprung Showa shock screams Suzuka 8 Hour factory superbike and everything from the ali single-sided swingarm pivot plates to the engine covers look anything but mass-produced. Happily the Honda goes as well as it looks. The motor is still the same longer-stroke 2006 Fireblade unit from the previous CB1000R, but the redline is up from 10,300rpm to 11,500rpm, power is increased 12bhp to 143bhp and there’s more torque to play with between 6000-8000rpm. The inline four-cylinder motor is calm and refined at low revs, but packed with midrange grunt and a fruity top end. The electronic throttle never surges or stutters and for anyone who’s ridden a big inline four, the seamless power delivery will be instantly familiar. Granted it doesn’t have the character of a twin, triple or crossplane crank four, but it growls when you prod it and accelerates hard enough to pull wheelies on demand. Smaller and squatter than the previous model, the Honda’s riding position is so natural you don’t think about it, there’s enough legroom for taller riders, but bars are slightly narrower than you’d expect from a big naked when you first jump on. The seat is comfier than it looks for a few hours…and then it isn’t. Steering is ultra light and accurate at all speeds, OE Bridgestone BT-021 tyres have adequate grip and front brakes have lots of feel and power (and if you hammer them really hard the hazard lights come on). The standard suspension is set for a plush ride, but gets floaty when you push hard and pegs stay nicely away from tarmac at full lean. Riding modes, that started life on the RC213V-S and trickled down to the new Blade, Gold Wing and Africa Twin, give you the choice of Rain, Standard and Sport settings with ascending levels of power, engine brake and torque control. There’s also a ‘User’ mode that lets you tailor the electronics to suit and of course ABS. None of the rider aids hinder you on the road, but serve as a silent safety net for when you need them. The CB1000R+ version we’re riding today has even more silicone implants, offering a crisp, accurate quickshifter and autoblipper, as well as usefully UK-hot five-level heated grips. There’s little doubt the Honda has its own unique style, is beautifully built, has perfect performance for the road and just like the ’08 Blade, its looks really grow on you. But when you look at some of its closest rivals it’s not cheap. A Z900RS, GSX-S1000, Z1000, base-model S1000R are all less and the MT-10 costs the same. But the Honda is refreshingly different and you just can’t help keep looking back to admire its strange beauty. 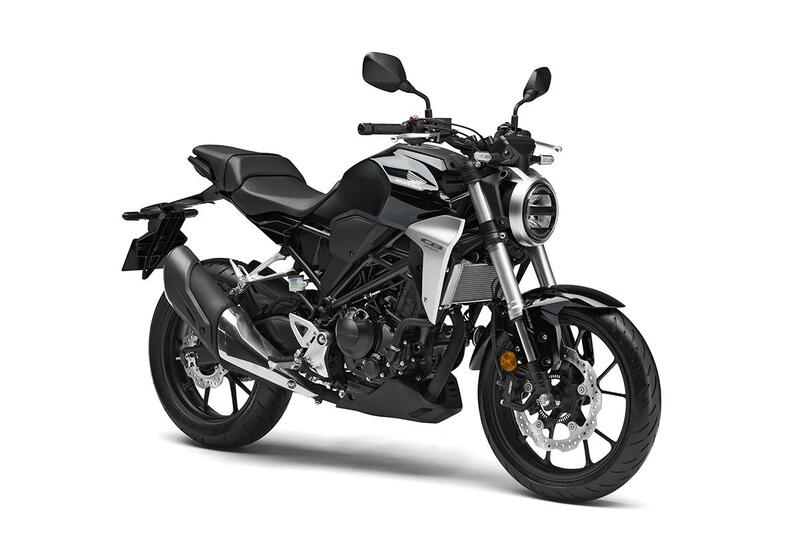 There will be two versions when the CB1000R hits dealers in May: the £11,299 base model and the £12,99 CB1000+ (as tested), which has a quickshifter, heated grips, brushed aluminium front mudguard and rear hugger panels, a fly screen, single seat cowl and radiator grill with CB1000R logo. Suspension: Fully-adjustable 43mm Showa Big Piston forks and single rear shock adjustable for preload and rebound damping. After teasing us with the Neo Sports Café concept, Honda have released the CB1000R – a sports derived naked that eschews its RR heritage. The styling is radical - dominated by modernist brushed steel rather than the hyper aggressive plastics of old - but there’s still a beast within. The CB1000R has a new Fireblade derived engine, which delivers 16% more power than the old model and 5% more torque in the midrange, so the power isn’t coming in the upper reaches like it does with the ‘Blade. Honda have achieved this in many ways but the chief reason is that the CB1000R motor has a longer stroke, compared to the Fireblade. It’s down geared too, meaning it’s quicker than the Fireblade to 80mph. As expected there’s a new exhaust strapped to the new block, which Honda say emits a raw-edged howl when the exhaust valve opens – although whether this exhaust will be as ear splitting is yet to be announced. Also moving over from the Blade is a new ride by wire throttle that has three preset riding modes plus a user customisable one. As you might expect, this brings all the riding aids present on the Blade. The CB1000R now comes with a slipper clutch and an optional quickshifter is available. Taming the new found power is a brand new steel chassis and Showa suspension, which has helped the bike drop 12kg over the old model although at 212kg wet, it’s no featherweight. In comparison to the Blade, the wheelbase is much longer to make it a more stable ride. Radial front brakes, ABS and a bigger rear tyre complete the spec improvements. 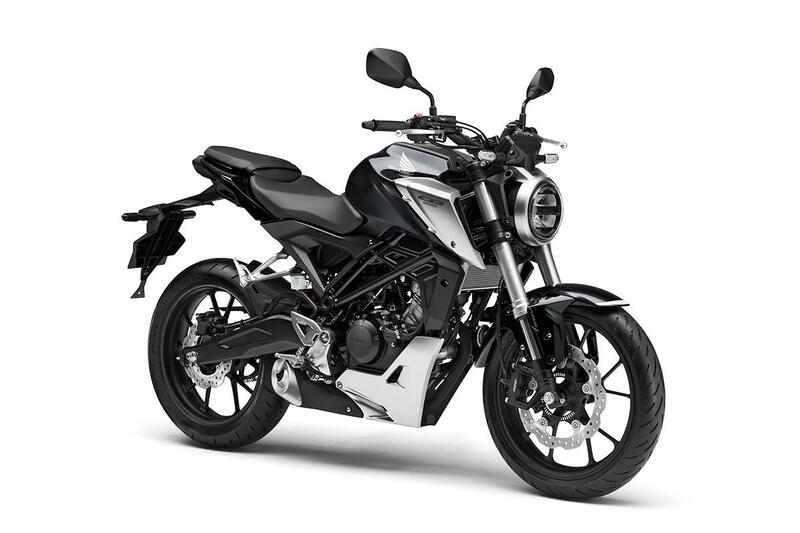 As well as the standard model, there will also be a CB1000R+ that comes fitted with a quickshifter, heated grips plus a range of other premium add-ons. But this all begs the question: is it enough? It’s down on power compared to its Euro rivals but unlike the Blade, there’s no magical low weight figure to save it. For bikers stepping up from a 125, it’s one hell of a leap to the CB1000R, so Honda have designed the CB300R – a distillation of the Neo Sports Café concept into a smaller, less powerful package. As well as mimicking the style of the big bike, the CB300R also has some good components on board including 41mm USD forks, a radial front brake with hubless disc, LCD dash, LED lighting and an IMU-based ABS. This is Honda’s first naked of this size to come to the UK, but the A2 market is crowded and the 31bhp of CB300R might be outshone by others going for the full 46.6bhp permitted. Naked 125s are great to get you started but with the exception of the KTM Duke, do very little to get your heart racing but the new CB125R does just that. Taking all the styling cues from the CB1000R, the little 125 really looks the part. Honda say the engine is free revving and delivers plenty of low down grunt that, combined with the low weight, puts a real spring in its step. The rest of the kit is good quality too with 41mm USD forks and preload adjustable monoshock. Like the 300, it also has a radial front brake, IMU-based ABS, LCD dash and full LED lighting.